Scarcity and subsequent steep increase in fodder prices coupled with acute labour shortage is resulting in dwindling milk production in many Indian states. In Dakshina Kannada and Uttara Kannada districts of coastal Karnataka, paddy straw is the main dry fodder used for cows. It has to come from 200 kilometers away. As paddy production is decreasing, this fodder is decreasing too. This results in many small farmers reducing their cattle number or bidding good-bye to animal husbandry. In Dakshina Kannada district, milk procurement by the popular DK Milk Union has come down roughly from 2,20,000 litres in 2007-08 to 1,35,000 litres in 2010. Dr K Krishna Bhat, a private veterinarian at Uppinangady, DK District and Director, DK Milk Union observes that milch cow population has come down by 30 per cent in his practicing area (15 kms radius). Even as fodder supply has started declining, it is not as if farmers have had no alternatives. Coastal Karnataka has large areca nut (betel nut) plantations. Areca leaf sheath has been used as supplementary fodder by farmers since decades. But no one was very confidant about its merits and demerits. Areca leaf fodder is naturally advantageous to farmers. First, it is locally available within the fence of each farmers gardens. 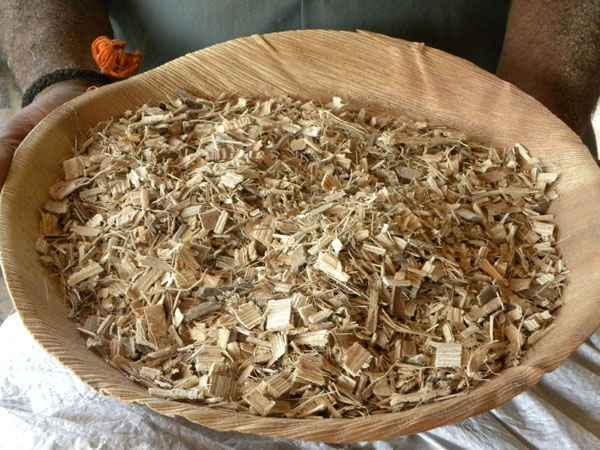 Second, it lacks the pesticide residue the paddy straw brings along that creates health problems for cows. This is how shredded betel nut leaves were fed earlier. Pic: Shree Padre. Cows relish areca leaf fodder. Milk production also has shown slight increase in areas where areca fodder has been used. Recently, animal nutrition scientists have studied areca leaf sheath fodder in detail and have announced that it can replace paddy straw. The National Institute for Animal Nutrition and Physiology (NIANP), Bangalore, has conducted studies about this under its Principal Scientist Dr N K S Gowdas leadership. They have brought out publicity material on this as well. 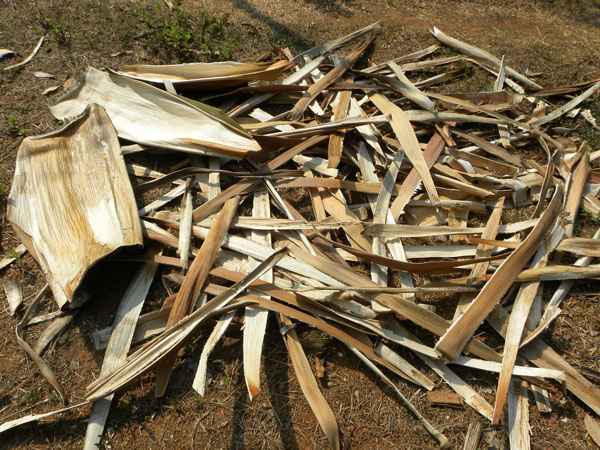 An experimental processing unit has been started in a Karnataka village that shreds dry areca sheath into small pieces. Cows relish this food. Milk production also has shown slight increase. This is how shredded betelnut leaves look today. Pic: Shree Padre. With some fine-tuning  like decentralisation - with the design of still more smaller machines that each farmer household can afford, this areca leaf sheath fodder is likely to be very popular. At present, areca sheath is shredded with the help of big machines  7.5 HP + 5 HP, which are not affordable for individual farmers. Hence farmers use ordinary pulverisers and slicers made for general purpose. In a sign of good things to come, one mechanical engineer who studied the problem says it is possible to bring out a smaller version of the shredding machine (2 HP). He is currently designing the same.